A scene allows you to visualize your data and analyze geographic information in an intuitive and interactive 3D environment. You can choose between a global or local scene to best display your data, such as airline flight patterns, campus facilities, or underground utilities. You can view scenes in either Scene Viewer or in ArcGIS Pro. A global scene is where you can display your spatial content on a sphere based on Web Mercator (Auxiliary Sphere) or GCS WGS 84 world coordinate systems. A global scene is good to use when you want to understand or provide context for phenomena that wrap around the spherical surface of the earth, such as global weather measurements, world population, or shipping lanes. You can also use a global scene to display your data at a city level or even down to a building site level. See an example. The main differences between local scenes and global scenes are that local scenes can display data that has a spatial reference in a local projected coordinate system (PCS); and the terrain and layers are shown projected on a planar surface rather than on a sphere. Local scenes are best used for displaying or analyzing data at the local or city scale that have a fixed extent in which you work . Local scenes are helpful for urban planning and visualization where you can view campus facilities or building developments. You can clip the extent of your scene and navigate underground and interact with subsurface data, such as utility networks or earthquake data. See an example. Clipping the extent of your scene has the added benefit of increasing performance and allowing for easier navigation underground. Your local cached data can have tiling schemes different than Web Mercator or WGS 84 and can be added to one local scene without any need for reprojection. For example, you may have an urban planning project and want to show buildings in your town, streets, parks and rivers, and the proposed elements of your project. Many times you will be working with data designed by engineers and planners that is projected in a local PCS. You can add this urban project data into a local scene and share with your organization, stakeholders, and the public. If your data extent spans a large geographical area, it is recommended to use a global scene. Geographic coordinate systems (GCS) are not supported in local scenes. Open Scene Viewer to create a scene. Your default basemap will determine whether a global or local scene opens. To change the scene type, click the New Scene drop-down list in the upper right and select New Global Scene or New Local Scene. When you first open a new scene, you can switch your basemap multiple times to any of the active basemaps before the scene spatial reference has been set. Hover over the scene logo to see the scene spatial reference. All tile layers in a scene must have the same spatial reference and tiling scheme. Cached layers (elevation layer, imagery layer, scene layer, tile layer, vector tile layer) are prerendered collections of map cartography or 3D objects organized by location and scale. Cached layers support fast visualization of complex maps, since the server distributes the preprocessed and compressed data whenever someone asks for a map. With cached layers, the spatial reference is defined in the service; therefore, it is not possible for them to be reprojected on the fly. Noncached layers (feature layer, dynamic map image layer) are a collection of geographic features. Each feature in the collection has a location, set of properties, attributes, map symbology, and pop-up. With a noncached layer the spatial reference is not defined in the cache and there isn't a tiling scheme. A noncached layer can be reprojected on the fly to match the basemap; therefore, you can always display noncached layers in a global or local scene. 256 by 256 or 512 by 512 pixel tiles. The scale levels must increase or decrease by a power of two. For example, if you start your scale at 1:128,000, the next levels should be 1:64,000 and 1:32,000. When you open a new scene, the default basemap plays an important role whether you open a new global or new local scene. 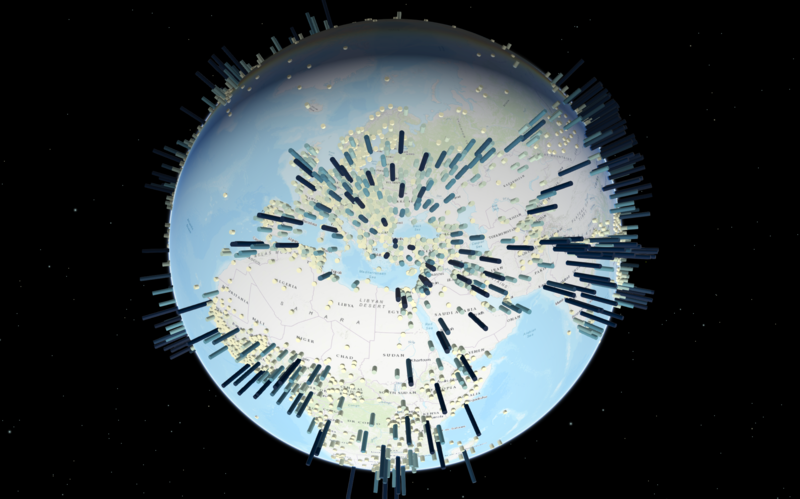 If your default basemap is in Web Mercator or WGS 84, a new global scene will open. If your default basemap is in a different projection than Web Mercator or WGS 84, a local scene opens. If you have privileges, you can use your own basemaps to create a custom basemap gallery. Basemaps must have a valid tiling scheme to be added to Scene Viewer. In global scenes, basemaps that are not in Web Mercator or WGS 84 will be disabled in the gallery. Furthermore, if your default basemap is not in Web Mercator or WGS 84, when you open a new global scene, the basemap will be dropped. If you want to work with these disabled basemaps, choose to open a new local scene and you will see your configured maps in the gallery. You can only add cached layers that match the scene spatial reference and tiling scheme. All basemaps that don’t match the scene spatial reference and tiling scheme will be disabled. The scene spatial reference is always set to the first layer's spatial reference. The scene tiling scheme is always set to the first layer's tiling scheme. If the first layer is a noncached layer, the scene spatial reference and tiling scheme are set to the basemap. When you create a slide or save a scene without adding a layer, the spatial reference and tiling scheme will be set to the basemap. If the first layer added doesn't match the basemap spatial reference, you can choose if you want to add the layer to your scene and drop the basemap. If you open a Web Mercator or WGS 84 layer, a global scene will open. If you open a PCS layer, a local scene will open.